The Equator Initiative organized a full day capacity development workshop for the 19 Equator Prize winners/SGP grantees invited to participate at the Thirteen Meeting of the Conference of the Parties to the Convention of Biological Diversity (COP13). 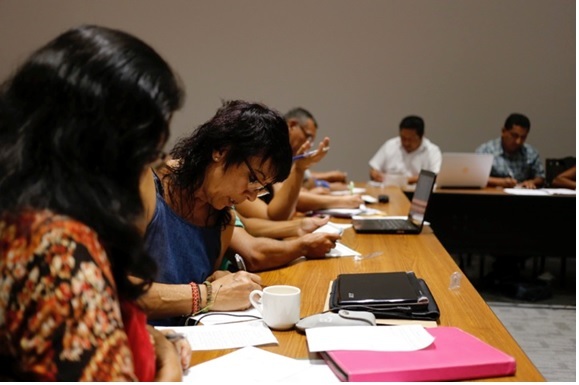 The workshop was a follow up to two online webinars: one focused on the COP13 themes and another on communication skills. The objectives of the workshop were to provide an introduction to the Equator Initiative’s activities at COP13; an overview of the Equator Initiative, NBSAP Forum and GEF-Small Grants Programme; a summary of the issues being negotiated at COP13 of key relevance to Indigenous Peoples and Local Communities (IPLCs); an overview of the Sustainable Development Goals (SDGs) and Aichi targets, and their linkages to IPLC work; and a training in communication skills: i.e. how to deliver a successful elevator pitch, identify key messages and tell a persuasive story. The workshop was also an opportunity to elaborate and fine-tune the Equator Prize winners/SGP grantees’ presentations for the “Indigenous Peoples and Local Communities Day” at the` Rio Conventions Pavilion on 8 December. As a result of the workshop, the Equator Prize winners/SGP grantees were able to engage at the Conference of the Parties with a clearer understanding of the international development context, of the issues discussed at COP13, and better equipped to deliver their presentations at multiple forums with diverse audiences. Equator Prize winners were also trained as spokespeople for UNDP, ready to speak about the power of local action for biodiversity conservation and the Sustainable Development Goals (SDGs).